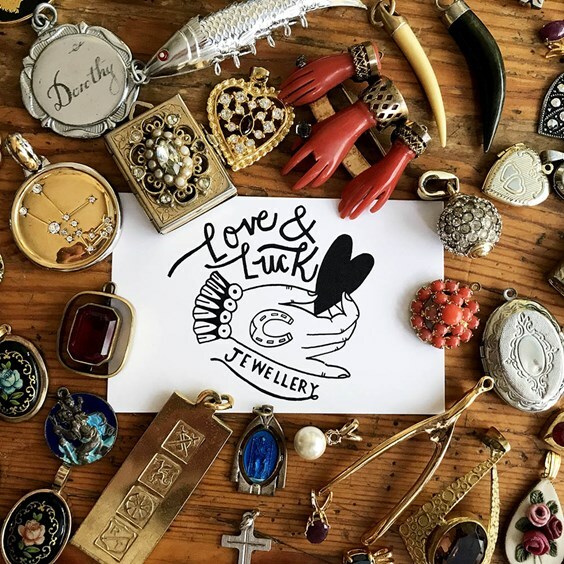 "Reclaimed & Lovingly Restored Antique Jewellery..."
Today we're so excited to share an exciting new project with jewellery enthusiast, Ella Masters. Ella is well known for her illustration work but from a young age has always had a soft spot for jewellery. After collecting pieces of antique jewellery for many years and experimenting with jewellery making, Ella decided to start Love & Luck, the perfect place to share her love for vintage designs. After discovering Ella on Instagram, we had to find out more about her story! 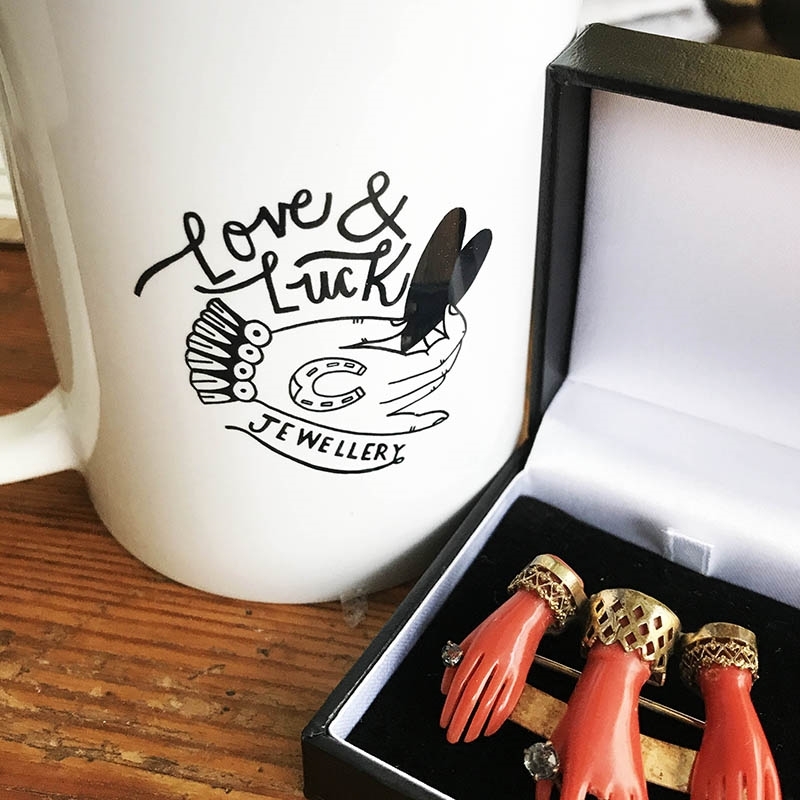 In this interview, we chat all about how this love for jewellery began, what jewellery means to her and how the new jewellery business started. Ella also shares her secret tips on how she finds the best pieces alongside her reclaiming process. A piece of antique jewellery holds memories, stories and were once treasured by its owner and what better way to value its history by continuing its story. 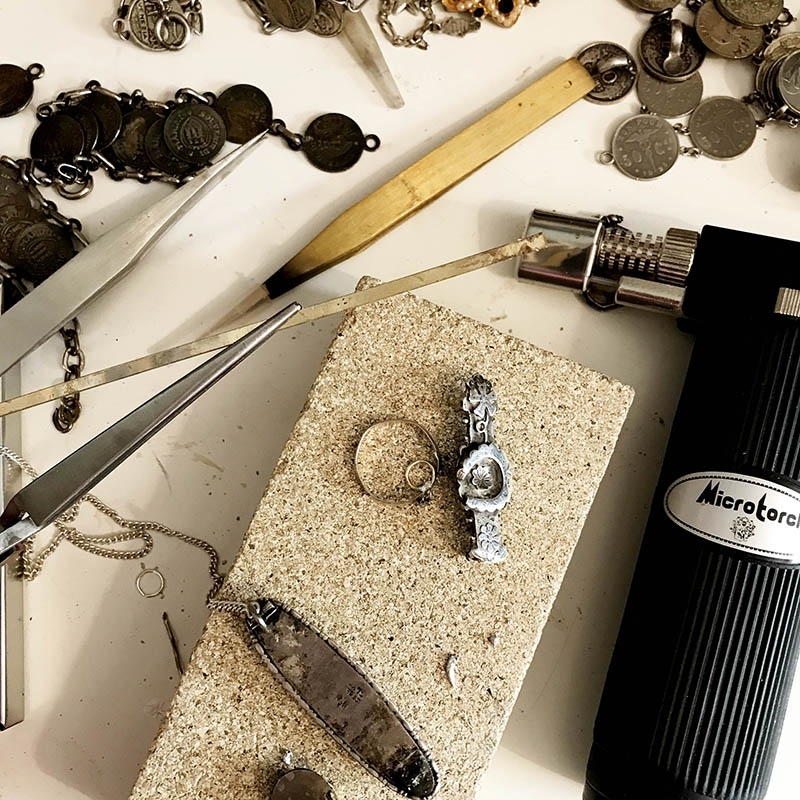 "I think for me, wearing and making jewellery is part of me, it combines my love of recycling and being creative..."
Where did your love of jewellery come from and what does it mean to you? I have always been obsessed with trinkets and sparkly things ever since I was a little kid. My mum got me into car booting and charity shopping at an early age, so I think it originally stemmed from my ability to rummage through boxes of other people’s rubbish and find gems that they were selling for pretty cheap, reassemble, give a little TLC to and create something no one else had. My paternal Granma always had the most stunning collection of jewellery and every Sunday me and my sister would spend hours going through her jewellery boxes and pick out our favourite pieces and then she would tell us the story behind it. When I got old enough she would allow me to keep a few and take them home. They were never anything expensive, like a little metal goldfish brooch that she had collected in the 70’s to a little silver and diamond solitaire ring that really wasn’t worth much but it reminded me of her. I think for me, wearing and making jewellery is part of me, it combines my love of recycling and being creative. You recently started Love and Luck, an online shop selling reclaimed vintage jewellery - where did the idea come from? I had started selling jewellery around seven years ago when I graduated from uni, but I moved on from the idea to pursue my illustration career. Fast forward a few years and I was getting messages from my Instagram followers asking me where I was getting my jewellery from. 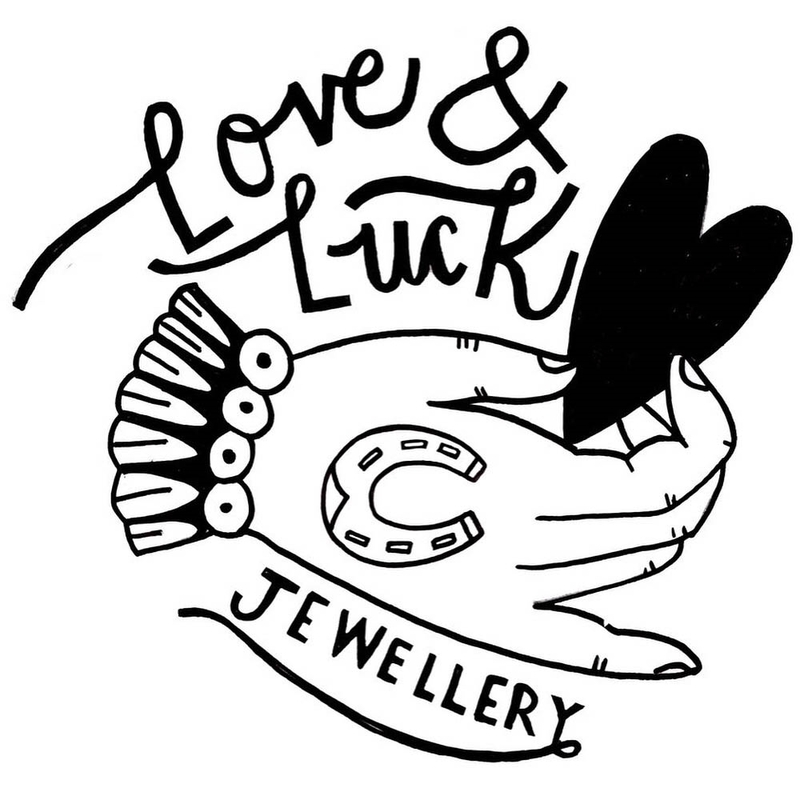 I realised people wanted the things I had found and then recently my youngest brother passed away which has spurred me to do more of the things I love so I set up love and luck its been open eleven days and its been pretty much a sell-out which is exciting! I also looked around at the other shops online selling costume jewellery at pretty high prices and I wanted to give people real gold and silver pieces they could cherish without them tarnishing and being thrown away, because everything now days is throw away that I just wanted to create and share pieces with a lot more love to them. 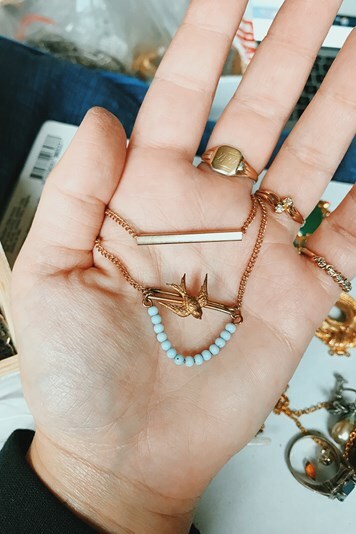 "I think having a piece that someone else has worn means carrying around with you a little piece of history as well as an absolutely stunning piece of jewellery that often or not, no one else you know will have..."
What has been your favourite vintage find? This morning I scored a really adorable gold and turquoise four-leaf clover which is up there and I know my mother would have loved. I recently hunted out a lucky horseshoe brooch that I reclaimed and made into a necklace that sold pretty much straight away that I absolutely loved, I think it was from 1890 I just love anything to do with history so it's combining two of my favourite things. What do you think is so special about owning a piece of jewellery that someone has already worn? I absolutely love history so I think having a piece that someone else has worn means carrying around with you a little piece of history as well as an absolutely stunning piece of jewellery that often or not, no one else you know will have. What vintage pieces are you drawn to the most and where is the best place to find them? 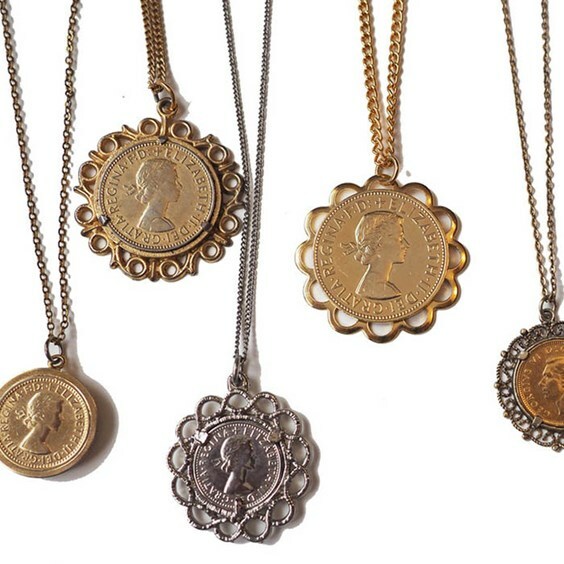 To be honest, I love pretty much most vintage pieces I’ve come across, recently I seem to have developed a slight obsession with antique silver Victorian name brooches and Figa Hand pendants ha! The majority of my collection has come from years of picking, I travel to old vintage shops, antique shops, car boots and occasionally online. My rule is if I love it, I buy it! Are there any vintage pieces that you just couldn’t part with? I have a few pieces, a recent silver and carnelian domed ring I found that just makes me smile so much when I look at it, that four leaf clover I scored might be staying with me! There aren’t many recently because I know I have so much and someone else will appreciate it I don’t mind letting it go to a new home! Can you talk us through your reclaiming process? My reclaim process really varies depending on the piece, often most piece just need some TLC a polish up and clean, other need soldering and resetting. I use a pretty basic soldering set, pliers and polishing cloths, it’s a pretty simple set up. 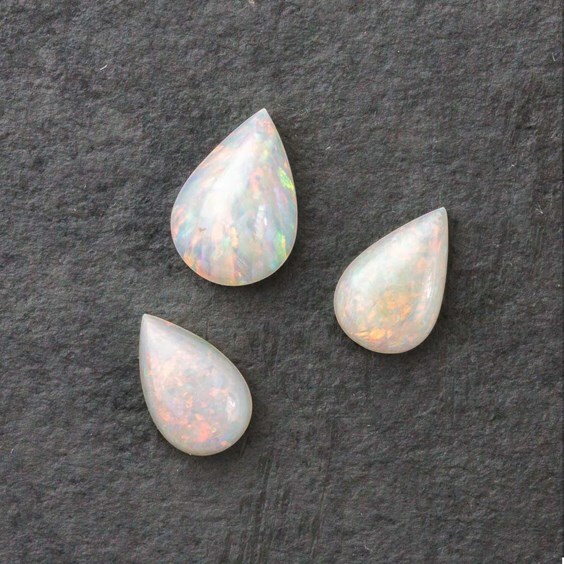 It’s always been opals and turquoise, I’m just drawn to the colouring in opals. 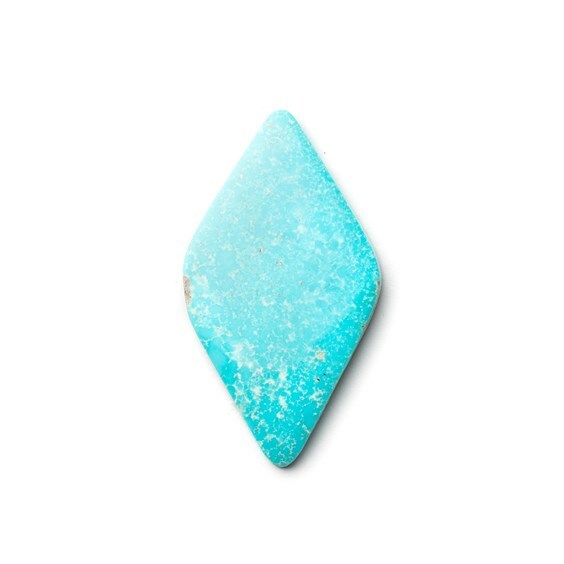 When it comes to turquoise it just reminds me of my late mum. 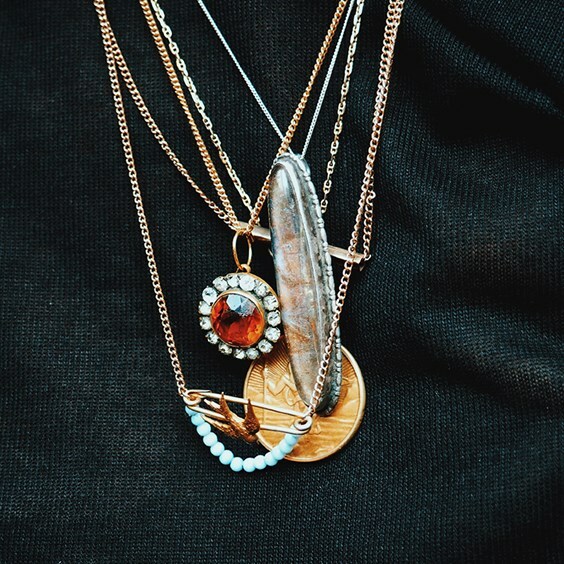 "Jewellery is a great way for someone to express themselves, it's just another extension of your outfit, which I guess in itself is you expressing who you are to the world..."
Do you think every piece of jewellery should have a meaning? I don’t think every piece of jewellery should have a meaning, if you like it and you want it then that’s good enough I guess, but maybe something draws you to a piece that reminds you of someone and that in itself is meaning enough. But to me the jewellery I wear every day has meaning, my great grandmother's engagement ring that was given to me when my mum died is one piece that doesn’t leave my sight. I have a silver marquisette heart ring that I picked up really cheap from past times when I was about 12 that I gave to my mum for Mother’s Day, when she died I got it back and wasn't worth a thing but to me it reminds me of happier times. 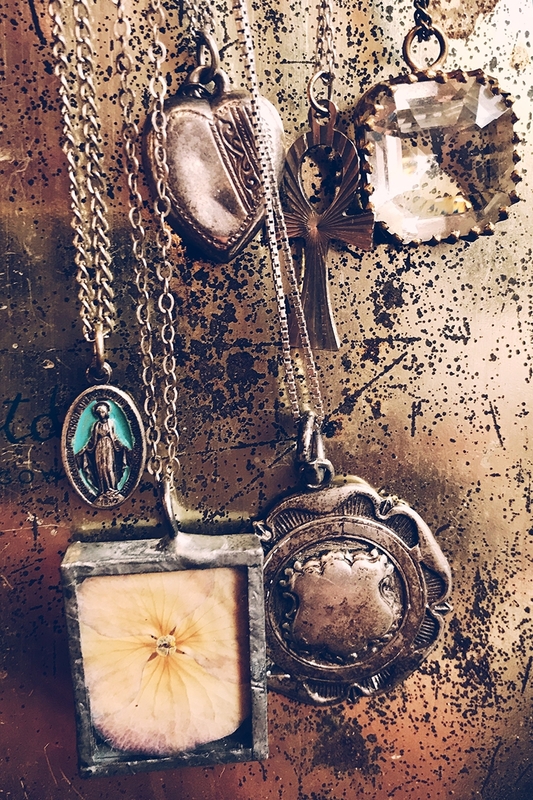 I like to think of the pieces that I sell and make as future heirlooms that hold meanings or will eventually have meaning to someone out there. How do you think jewellery can help someone express themselves? Jewellery is a great way for someone to express themselves, it's just another extension of your outfit, which I guess in itself is you expressing who you are to the world. I’ve been known for my jewellery collection throughout my life so if I’m not wearing at least one thing I feel bare. 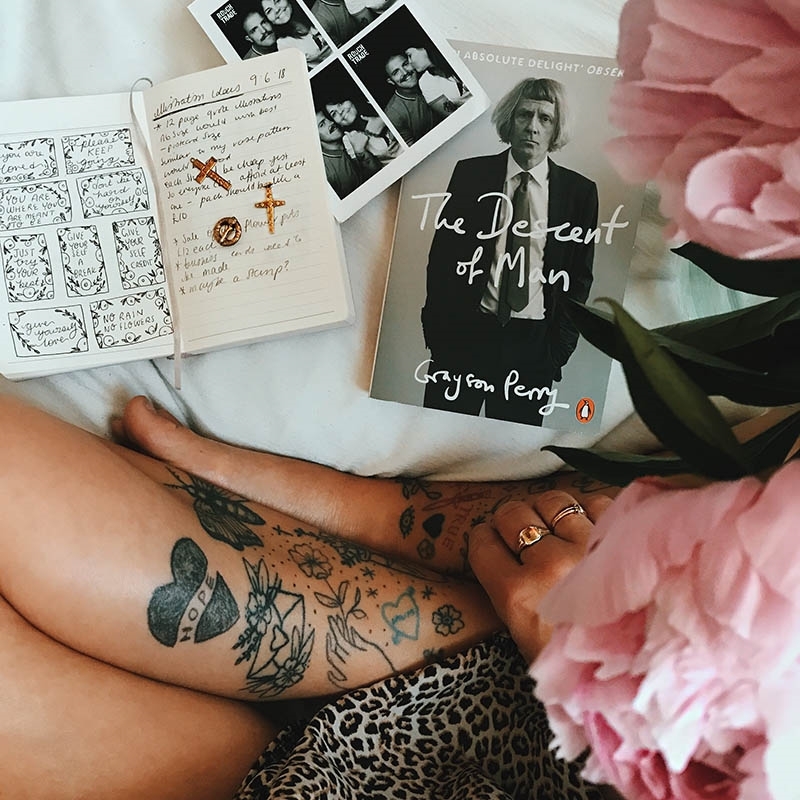 You can wear jewellery in many different ways to express yourself, I have piercings along with my tattoos that stand out and are a way for me to be myself. I’ve never been one for large statement pieces but that’s another way of showing the world who you are. You're also an amazing illustrator – have you ever combined your skills of illustration and jewellery making? Haha thank you I’m alright I guess ha! I used to combine my illustration with my old jewellery shop and create illustrated shrink plastic pieces. But I guess being an illustrator, I get to combine my drawing skills in my logo and aesthetics. I am thinking of bringing out a new miniature collection on porcelain. Inspired by the antique miniatures that people used to own of loved ones or deceased family members. You're signing up for a silversmithing course - what are you hoping to get out of this? I am, I’ve dabbled with a bit of silversmithing in the past, but want to actually be a lot more knowledgeable about metal, stones and each piece. I also want to able to create my own things that could potentially be future heirlooms. I love the idea of being able to create modern memento mori pieces. After recently losing my mum and brother, I want to be able to create a pendant which will house locks of their hair. Its something the Victorians were renowned for and its something that has fascinated me since I was a child, seeing my Granma’s locket with my Granddad's hair in. Some might find this morbid but being able to have a loved one close to you Iis something that I find really comforting - so that's something I want to learn to create for others. Also if I’m honest I just love learning new things so I’m hoping it will be fun and worth it. 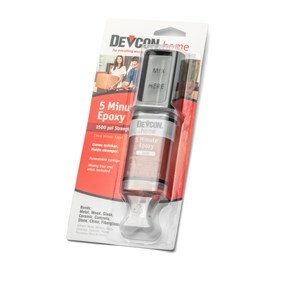 This is such a great product for renewing the sparkle on silver jewellery and great for removing tarnish from hard to reach places. All you need to do is immerse your jewellery in the solution for a couple of minutes and it will be sparkly again. 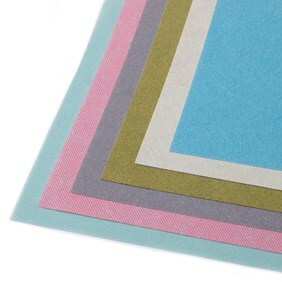 Another simple way to create a shine on your jewellery and to remove marks is to use polishing papers. Simply work up the coloured grades for a gentle polish. 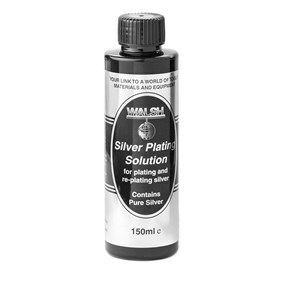 Use this handy solution for plating or re-plating silver and most other metals. It adds pure silver to your worn silverplate as well as brass, copper, nickel and bronze. It can even be used to add get that sparkle back on your table-wear, cutlery and photo frames! For jewellery making, we always recommend this high-quality glue. This is great for old pieces of jewellery, where a gemstone might be loose - you can use this glue to secure it properly so it doesn't fall off. 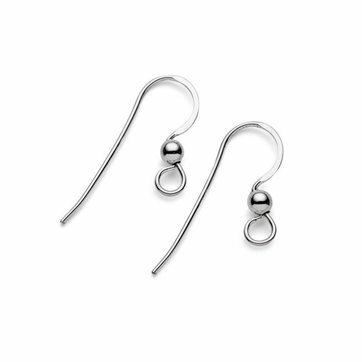 With old jewellery, the earwires or findings may need replacing. Especially if you want to give the jewellery as a gift, you will want to replace the earwires with new ones, this way you can still keep the beauty of the jewellery. If you worried about the findings being too old and looking like they could easily break, it could be worth replacing the clasps for a secure design. 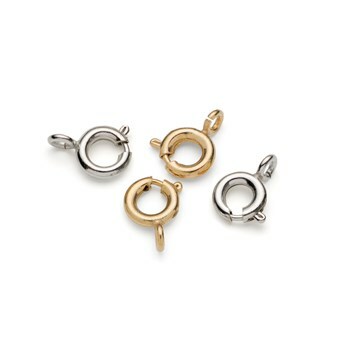 We have a range of bold rings, carabiner clasps, toggle clasps in sterling silver, 9ct gold, silver and gold plated to suit your piece of jewellery. You could have a piece of jewellery that was passed down to you. These types of sentimental pieces are something you don't want to lose! 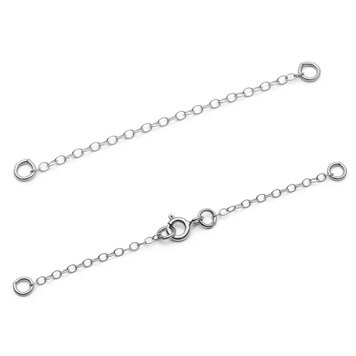 Using a safety chain adds that extra level of security so you don't have to worry about losing it when you wear it. We also have a range of necklets, loose chain and bracelets in case you want to replace this too.